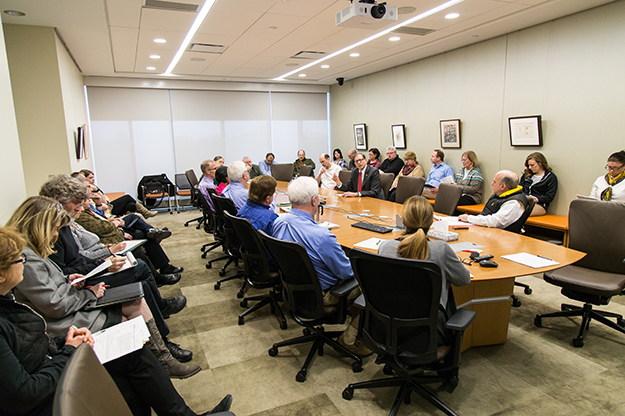 A menu of budget options: that’s how Joshua Wynne described possible budget cuts at a special meeting of the Faculty Academic Council at the School of Medicine & Health Sciences March 23. 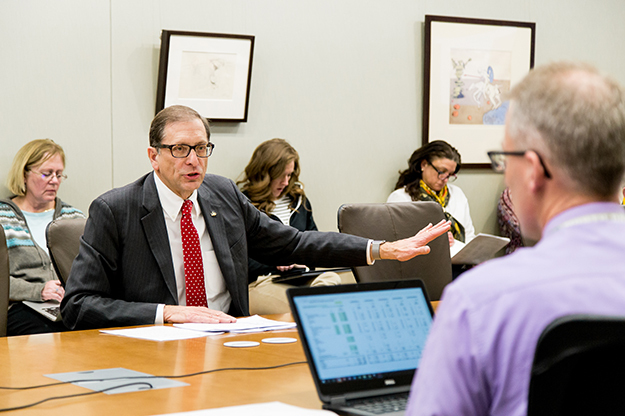 Wynne, UND vice president for health affairs and dean of the School, discussed possible budget reductions and sought input from the Faculty Academic Council, which is made up of associate deans, chairs, and faculty. The School has prepared a 90 percent budget for the upcoming biennium, totaling about $4.9 million in cuts. 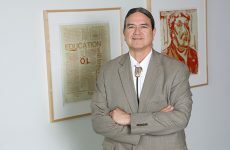 The School is funded separately from UND, and its budget is submitted through UND to the North Dakota University System and then to the Legislature. Wynne said that all departments and units in the School gathered input from faculty and staff during the preparation of their proposed budget cuts. Terry Nelson, associate director of Administration and Finance for the School, attended department and unit meetings as they determined how to meet budget reduction goals, then combined and summarized the budget reduction options for the School. Proposed faculty position cuts at the School include 3.26 voluntary separations, one of which would be replaced at a lower salary, and 3.22 unfilled positions. Staff position cuts include 7.10 voluntary separations, three of which would be replaced at a lower salary, and 5.79 unfilled positions. Funding changes, such as using non-appropriated funds, would affect 2.53 staff and 3.32 faculty positions. Operations would be reduced by $1.25 million, mostly through efficiencies. Nelson said efficiencies include residency recruiting, conferences and meetings, travel, and other items. Proposed cuts for units are $844,555 for biomedical sciences, $1,861,181 for clinical departments, $712,900 for education, $927,900 for health sciences, and $562,997 for the School’s administrative and other departments, including student affairs and admissions, Indians into Medicine (INMED), alumni and community relations, Center for Rural Health, Child Evaluation and Treatment Program, and the Center for Health Promotion & Prevention Research. Some units proposed cuts that exceeded the 10 percent target. Clinical cuts were targeted at 10 percent. When Nelson was asked how much payments to hospitals and physicians who teach medical students and residents would be reduced, he responded that he did not have that level of detail available, but the reduction proposals had been made by the clinical departments themselves. The medical library will cut an electronic journal service. Wynne added that electronic journal subscription costs have been rising around 8 to 10 percent per year. “This is unsustainable, not only for our medical library but also for all libraries” he said. “It’s a built-in destabilizer of educational budgets.” Wynne said it would have to be addressed in the long term. Wynne said that following legislative testimony before the House, the School provided answers to three additional questions: What is a residency? Where are the newly approved residencies located? How does the School use philanthropic donations? He explained that the new residencies emphasize primary care and utilize rural hospitals throughout the state, and donations are focused on reducing student debt. “Thanks to donors, we have gone from the 75th percentile in medical student debt to the 33rd percentile,” Wynne said, adding that high debt can be a barrier to rural practice because of lower pay. The Governor’s Executive Budget has also cut one-time funding, which paid for a large portion of the Healthcare Workforce Initiative, a successful program that is increasing the number of physicians and other health professionals working in the state. Wynne told the council he wants to do as much as possible to minimize tuition increases and keep student debt low, as well as to continue to fully implement the school’s Healthcare Workforce Initiative. Photo by Tyler Ingham. Wynne said he wants to do as much as possible to minimize tuition increases and thus keep student debt low, as well as to continue to fully implement the Healthcare Workforce Initiative. One faculty member asked about the MIRA budget process and the possibility of requesting additional funding from UND after it is implemented. John Shabb, associate professor of biomedical sciences, explained how the Model for Incentive-based Resource Allocation (MIRA) process will work, and said it will not be implemented this year. “The School is not inclined to request more money at present from the central campus to support, for example, undergraduate education,” said Wynne, who added that the School’s budget target is less than the rest of campus, and that has not gone without comment. “UND is suffering greater financial impact than the School from the proposed legislation,” Wynne said, with up to 12 percent reductions possible at UND. Also, the main campus covered last year’s allotment budget reduction to allow construction of the new School of Medicine & Health Sciences building to continue unimpeded. 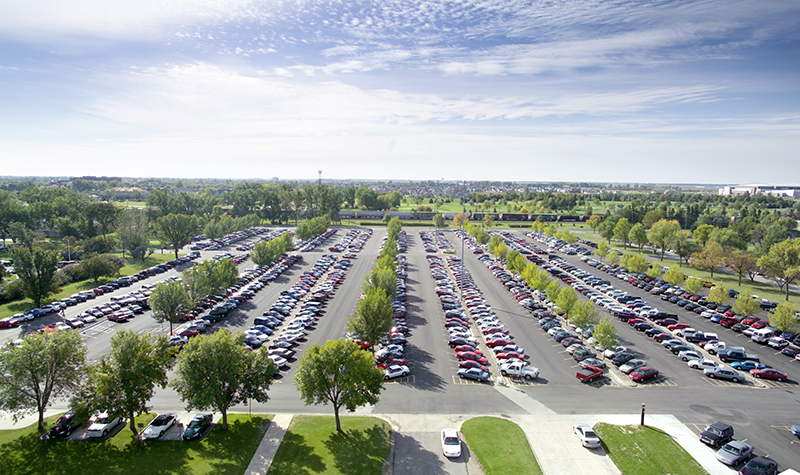 “We have a moral obligation to the University to ensure that UND is held whole in this regard.